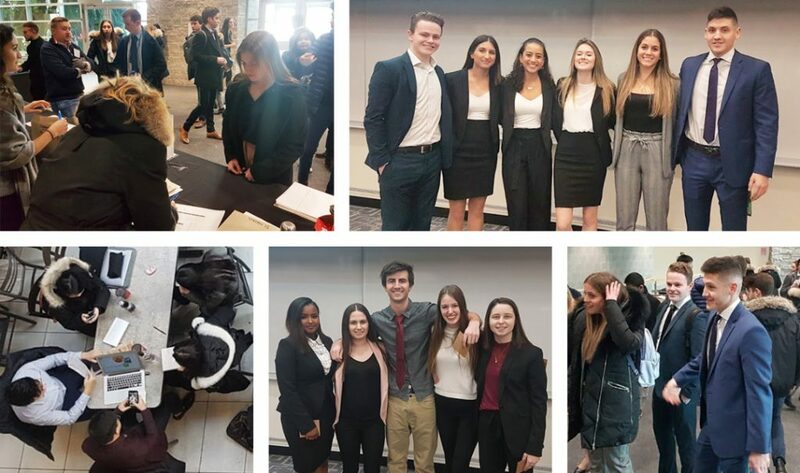 The first-year B.Comm cohort at the DeGroote School of Business participated in the 24-Hour Case Competition with a focus on financial literacy and planning. The first-year cohort of the DeGroote School of Business Bachelor of Commerce participated in DeGroote’s 24-Hour Case Competition, with a focus on financial literacy and planning. The competition was the first of its kind at DeGroote. “For 900 students, having fun and getting to know their peers this weekend was an important part of preparing for the future of work,” says Associate Dean Sue McCracken. On Friday evening, the students were divided into hubs and attended opening ceremonies, during which they received their case and activity details, along with timelines for the next 24 hours. The case, written by DeGroote alumnus Geordie Stewart, focused on a student who had started her Bachelor of Commerce at DeGroote with a less than ideal financial situation. Limited savings, no part-time job and no plan made it unclear how Terry, the fictional student, would be able to pay for school, necessities and her rapidly expanding social life. Students were challenged to help Terry build the initial components of a financial plan to guide her through university and beyond. The case competition’s collaborative element is an essential part of McCracken’s vision for fostering an environment of belonging and transforming business education through increased engagement between students and their peers, faculty, alumni and employer partners. First-year students also got their first opportunity to experience this vision in September, when they participated in DeGroote in the Field, a full day of welcoming activities. The 24-Hour Case is just another example of thje concept, which will also build on DeGroote’s already strong academic foundation, McCracken says. Students used those essential skills on the Saturday of the case competition, when 171 groups presented seven-minute action plans and recommendations to one of 18 judging panels, each consisting of faculty, alumni and/or employer partners. Students will receive written feedback from the judges in an upcoming tutorial so they understand what they did well and what could be done differently for future presentations. Top performing teams were acknowledged at the closing ceremony on Saturday afternoon, exactly 24 hours after the start of the competition. Beyond the numerous benefits to students, 24-Hour Case was also an opportunity for DeGroote to connect to with its alumni and several employer partners from firms that included FutureVault, Planswell, Loblaw/OCE, Unifi, Huxton Black and Arch.